Those who we know as the Celts are the fiercely independent tribes that the Romans referred to as the Gauls, Galli and Galatae, and the Greeks named Keltoi. Their brilliant boasts, riddled wit, generous insults and terrible battle screams haunt the mountains and rivers, the high hills and hidden valleys of ancient Britain and Europe. Something of their light and darkness lingers still within our veins, like the golden mead so favored by those warriors of life and death. 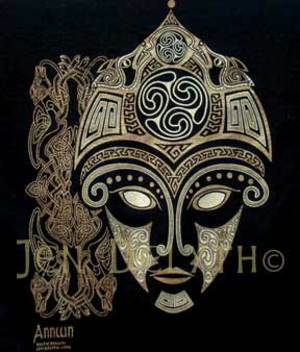 The Celts were not a single race of people, but a tribal culture that spread as a vital force of ideas communicated through their mystical symbols. Masterful artists, they created images of deities for their shrines, and crafted symbolic decorations upon everyday items of pottery, wood and leather. They designed richly decorated, intricate gold and bronze objects for the emerging class of aristocratic warriors and chieftains. 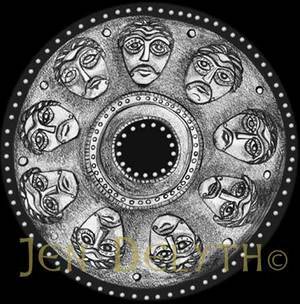 We must seek to find the Celts through their brilliant mastery of iron, gold and bronze, their weapons, coins, jewelry and horse bridles – all decorated in high style and with mythic profundity. Woad is the blue plant of the tribes. In modern folklore we imagine the ancient Picts and Celts as fierce, naked warriors, their bodies painted with blue spiral and animal designs. Some say woad was used as the ritual body dye of the Celts, and this native wild plant has been symbolically chosen to represent the color of the Tribes. Woad is the blue of the earth. It reflects the mystical color of sky, of the Otherworld that awaits great warriors who are honored in battle. The Brigantes of ancient Britain had blue shields, and blue was connected with the Celtic goddesses of war. It was also linked with the fertility of the earth and blue was chosen as the good-fortune blessing color for women’s clothing. Tribal – the very word evokes ideas of independence of spirit and community, honor and loyalty within the group. A tribe is governed from within, and is answerable to its own needs and rules.Early tribes of Britain and Europe developed their religion, their mythology and their culture throughout the Bronze and Iron ages, adapting the beliefs of the Neolithic cultures of the stone builders who came before them. Their profound certainty in an Otherworld, and deep respect for the numen – the sacred spirits of the land – continued to be revered at the wells, rivers and lakes, the rocks and ancient groves, the mounds of the Ancestors.